It may take a little more time to cook from scratch, but it tastes so good! I found an old Taco Cornbread Casserole recipe in my binder that called for Jiffy Mix, a packet of taco seasoning, and a jar of salsa. With my re-working, it’s made from scratch with yummy ingredients and no preservatives or extra sodium. You can change up the seasonings to make it spicier for your family (my girls won’t tolerate the chili powder). Preheat oven to 400 degrees. Prepare a 9×12 baking dish or similar with nonstick spray. Add the filling ingredients to a skillet and simmer on stovetop for 15 minutes, stirring often. The mixture will thicken as the juice from the tomatoes cooks off. Pour the filling into the prepared casserole dish. Sprinkle the cheese evenly over the top of the filling. In a bowl, prepare the cornbread batter. Spread over the top of the casserole. Bake at 400 degrees for 15-20 minutes or until cornbread is cooked through. Cut through to the filling to check for doneness. If you prefer, replace the spices in the filling with one taco seasoning packet. follow my Capitivating Casseroles board on Pinterest. 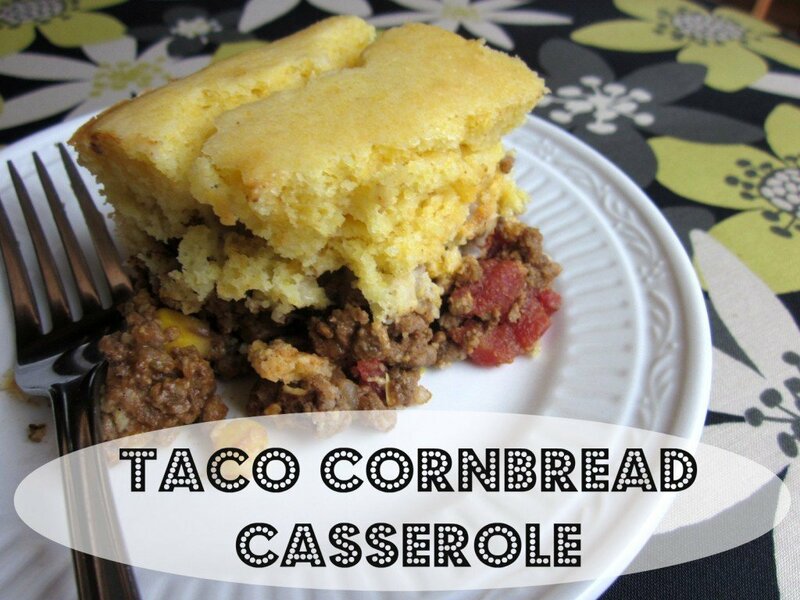 This Taco Cornbread Casserole recipe is linked up to Tasty Tuesday at Balancing Beauty & Bedlam and Fluster’s Creative Muster Party at Fluster Buster. Made this tonight and it was SOOOOOO good! Great re-work! Thank you! So glad you enjoyed it. Thanks for leaving a comment, Danielle!